Hello from Kansas City! I’m glad to be home with Cookie. We have a lot of snuggles to catch up on. I’m still mentally processing my post-cookbook Morocco vacation, but I’ll share more about it soon. I’m actually thinking about creating a separate travel/lifestyle section of the blog, with its own separate email list—would you be interested? Today, I’m sharing my next giant salad challenge recipe—the idea being that you make the salad and dressing at the beginning of the week, and store them separately. That way, you can enjoy salad all week long! I loved your enthusiasm for the concept. Here’s an enormous version of the little side salad with carrot-ginger dressing that you met a couple of weeks ago. It’s exactly what I’m craving after two weeks away from home. This one’s full of leafy greens (you know those are healthy), cruciferous veggies (remarkable free radical fighters), and beta carotene-rich bell peppers and carrots. I added some cooked edamame (soy beans) for protein. Bottom line, it’s crisp and delicious and I think you should make it! 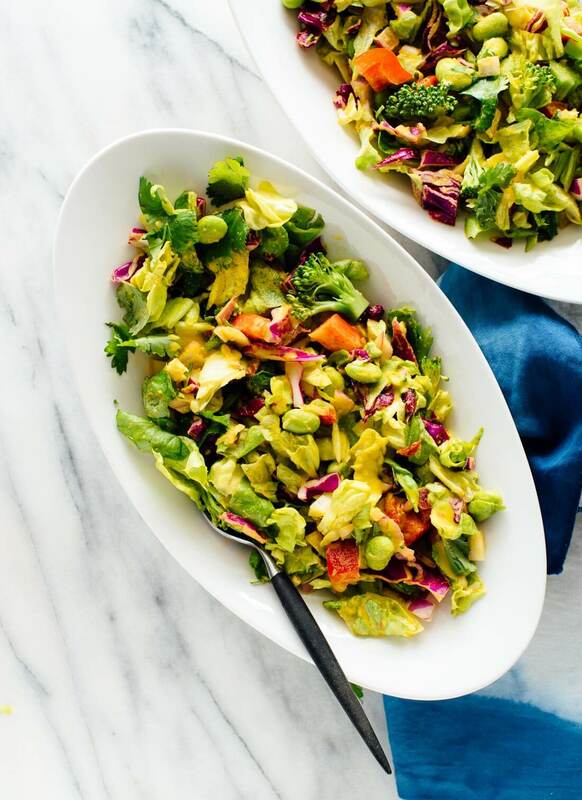 This healthy green salad features crisp lettuce, edamame, chopped cabbage, bell pepper and broccoli in homemade carrot-ginger salad dressing. So delicious! Recipe yields 4 medium-sized salads. 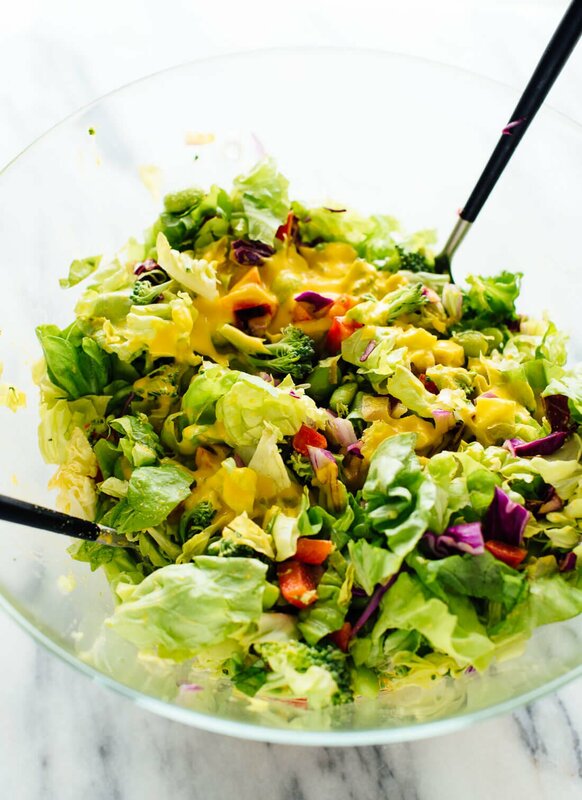 In a large serving bowl, combine everything but the dressing. Toss to combine. When you’re ready to serve, toss in enough dressing to lightly coat all of the ingredients—or, if you intend to have leftovers, store the salad separately from the dressing, and toss individual servings with dressing just before serving. The salad will keep well this way for 3 to 4 days. 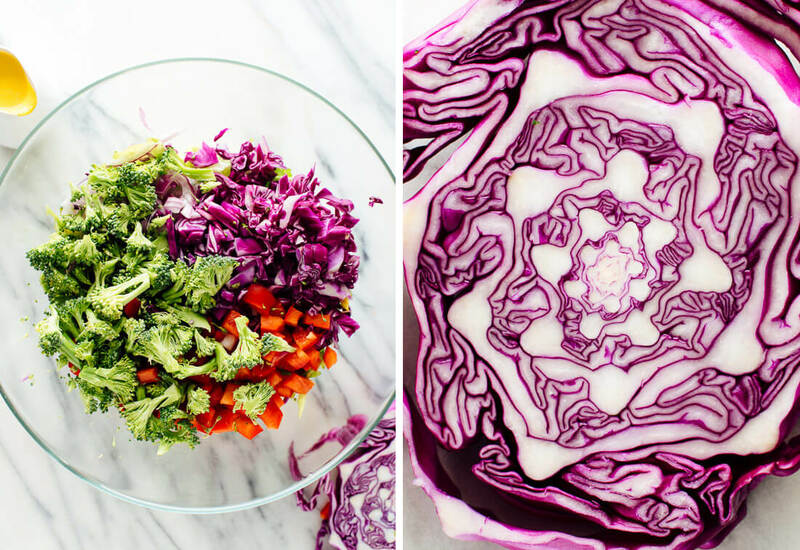 I love salad recipes that can be made in bulk and eaten for an entire week. I made your chopped Italian salad this weekend and have been eating it for lunch every day. My family (Italian dressing lovers) went nuts for the dressing. Thanks for all your wonderful recipes! I’ve already pre-ordered 2 copies of your book — one for me and one for a friend! I hope you do! Thanks, pal. Welcome home. I would LOVE to read about your travels, so a travel/lifestyle section would be wonderful. I bet wrapping your arms around Cookie was the best part of your return trip! I love to travel, but going home to my dogs gives me such joy. Would love to read your travel/lifestyle blog so I can travel along with you. Haven’t tried any of your recipes that weren’t wonderful. Keep those recipes coming and now a travel/lifestyle too. It’s last on the list of ingredients for the salad. You have to click on it to see it. Oh, in the spring time I just want all of the salads and this one is gorgeous. I’ve been thinking about adding another aspect to my blog and I, too, have been wondering “do I make it a whole other thing or do I just incorporate it into my regular posts?” It’s a struggle. Do I change what I’ve already established or do I give myself one other thing to juggle? Either way, I’d love to hear about Morocco! Right?! Exactly what I’ve been wondering lately. I haven’t gone through my trip photos yet, but hope to share soon, somehow! Such lovely colors, as always! 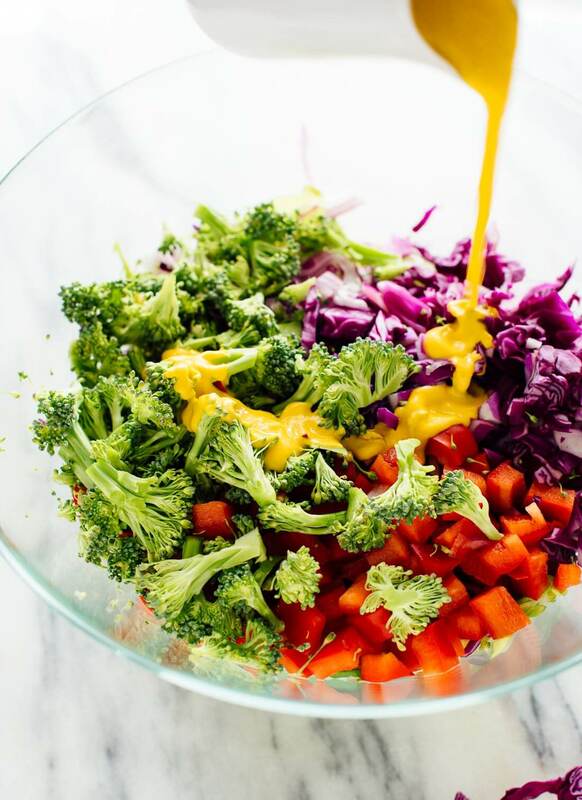 That dressing looks so tasty and this salad so easy to throw together! This recipe looks great, I love ginger-y dressings! Ahh I hope you had an amazing trip!! I’m big on doing salads the same way, since we never finish them in one sitting. That carrot ginger dressing looks SO delicious! Thanks, Nicole! It was an incredible experience. I hope you like the salad! I would enjoy a travel/lifestyle section. I really enjoyed your instagram posts while you were gone. I have been fortunate to travel to many countries, but will probably not make it to Morocco. So to see the gorgeous areas that you visited was interesting! Glad you are home with Cookie. Puppy snuggles are the best!!! Thank you, Kelle! I’m glad to hear you enjoyed the Insta stories. I had to wait to upload until I found wifi, so they were a bit scattered. I hope to start that new travel section soon so I can share more photos here! Wow Kate, what a fantastic salad! I love all these Asian flavors! Would love to see a lifestyle section on this blog!! YES! Thanks for weighing in, Katie! 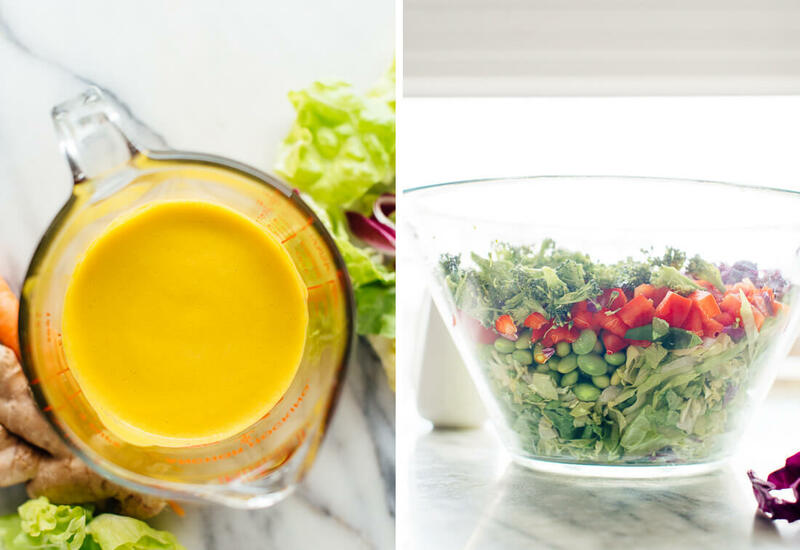 Carrot ginger dressing sounds like a dream! I always find homemade dressings sooooo rewarding and tasty. can’t wait to try this. I love traveling so yes, a separate travel blog would be great. Thanks for the great salad idea! Lunch for tomorrow. Yes to the travel/lifestyle section. I don’t get to travel much so I can enjoy your travels vicariously. I preordered your book today! Can’t wait to see it. Thanks, Beth! I can’t wait for you to see the book! I don’t really care that much for edamame. What else could be added for protein ? Do you think chickpeas would work ? I think chickpeas would be great, as they are just as mild as the edamame. Awesome, Hanne! So glad to hear that. I just made this salad for lunch and it so delicious I will be serving it for dinner to my family tonight. It will go perfectly with the wonton meatballs I am making. Another fabulous recipe! Hi Lora, thank you for your feedback! So glad you loved it; hope your family does as well. 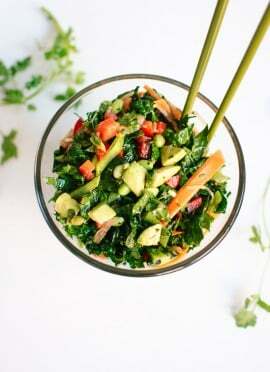 I have to tell you how much I LOVE the giant salad challenge recipe! Please keep this one going. It is amazing having a composed salad in the fridge that is delicious, unique and nutritious. Makes lunches so much more interesting. Keep it up. Can’t wait to see what’s next!! Thanks, Tory! I love coming up with giant salads so you can expect more soon! 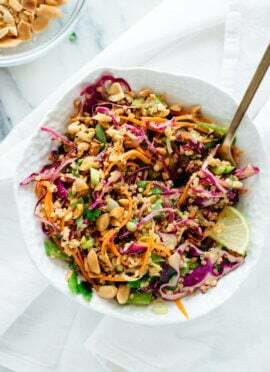 The carrot ginger dressing is delicious & versatile, Ihave made it 3 times in the past 2 weeks and have served it as a salad dressing, sauce for spiralizer zucchini noodles, and as a topping for vegetable sushi. Thank you so much for this inspiring recipe! Thanks, Kris! A zoodle dish with that dressing sounds excellent. I might have to try that! I love the make-it-ahead idea, Kate! I first learned to do this from you, with the kale salads. I’ve gotten to the point where I have to have dinner ready when I walk in the door in the evening — I don’t have a lot of patience for hauling out ingredients and chopping when I’m starved! I have a question about edamame. I’d never had it before, and several months ago bought it. Well, it smelled so foul when I opened the package I had to return it. That awful sulfur kind of smell. As a result I don’t know if I’ll ever try it! So … what is it supposed to smell like? Thanks! I hear you on the hangry front! Hmmm, was the edamame fresh or frozen? I buy frozen and defrost them in simmering water for about 5 minutes. They don’t smell much like anything when they’re frozen, of course. I wouldn’t say they smell particularly sulfurous, ever—just green/planty. You might have gotten a bad bag? Thanks for the response! Yes, it was fresh (well, not so much, apparently!). I will look for the frozen kind. I can’t believe it never dawned on me to make one big salad! I’ve been trying to motivate my fiance to make his own lunches for work and this has made all the difference. 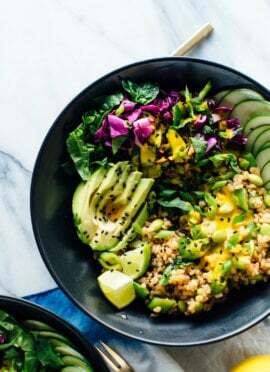 We’ve been loving your recipes since we decided to eat more plant-based and this is the first of your salad recipes I’ve tried. Besides being delicious, it’s so pretty. I’m planning on making it for my fiance’s surprise 30th birthday party this weekend! Oh, awesome! Thanks so much Samantha. I hope the party goes well! Made this tonight for dinner – your recipe is delicious and filling as always! Thank you! I have made this and I love it!!! I also purchased your cookbook!! OUTSTANDING!!! BEST EVER! THANK YOU!!! Wow, LOVE this dressing. Since I’m GF/dairy-free/soy-free its really hard to find Asian recipes that pack tons of flavor and are easy. This recipe SOOOOO hits the spot. Even my omnivore husband asks for a salad with this dressing on the regular! Thank you, Kate!! The salad is so light but satisfying thanks to all of the crunchy veggies. The dressing required some slight adjustments but I’ll include those on the dressing recipe page. The salad was extra yummy with chopped almonds and diced avocado to contrast with the vinegar dressing! Hi! I looove your recipes! With tbis one, does the nutritional information include the dressing too? Hi Paris, sorry for the confusion. I just double-checked and the salad does include 1/4th of the full batch of carrot-ginger dressing (you might not even use that much). I’ve adjusted the serving size info clarity. HI Kate…..I am loving your book and have made a few great recipes already. I have been tasked with bringing a “large salad” to Thanksgiving dinner next week (traditional turkey menu). I have printed out the colorful chopped but wondering if you have thoughts of something else for this special occasion. I have not been on your blog yet. I do get the newsletter too but am not always able to read everything.